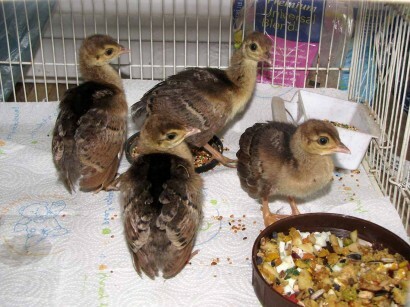 Remember the new little peachicks from a few days ago? (“Peacock, Peahen, Peachicks!“) They were doing well, but they were a little wayward. All the little peachicks seem to like to wander. Instead of sticking close to their mama like the chicken chicks do, they want to go off exploring. 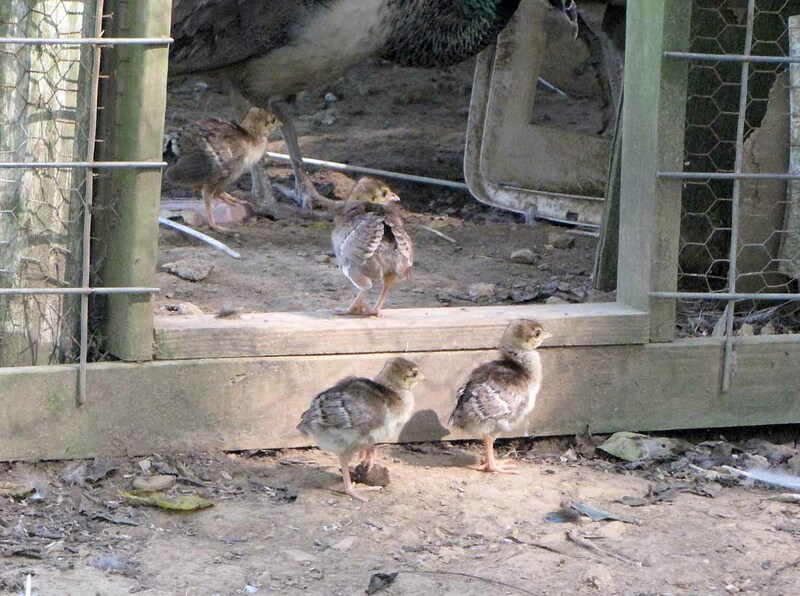 This distresses the mother peahens when the peachicks crawl through the wire and get outside the aviary. However, most of the time they come right back in. Nope, they got out and would run around until the managed to get over into the chicken pen, then they couldn’t figure out how to get back to their mother. Friday night I caught them and put them both back with the mama who had been running up and down the length of the aviary crying. 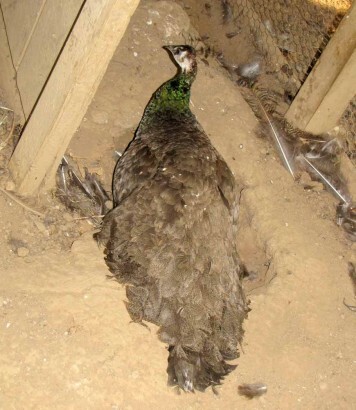 I’ve never heard the peahens cry like that. Anyway, I thought they’d stick close to their mom through the night. Well, I was wrong. Next morning one was back in the chicken pen and the other, well, who knows where it ended up? I fear it because some predator’s dinner. I had thought to leave these little peachicks with their mom a few days longer since she was so obviously attached to them. 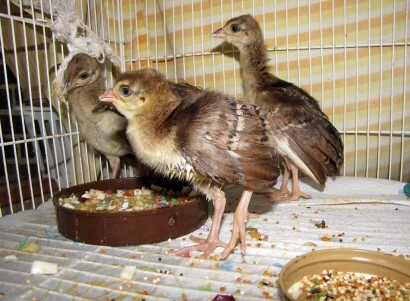 However, with one gone and the other still prone to wandering, I went ahead and put it in the birdcage with the other peachicks. 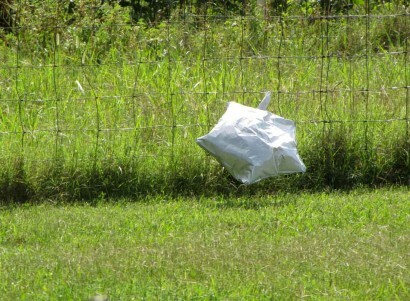 That left us with one majorly mourning peahen. She walked up and down the sides of the aviary. And she cried. Lots. Now that like to have broke my heart. She sounded sooooooo pitiful! The mama peahen has had a couple of days to adjust and isn’t crying continuously any more. People who don’t think animals have feelings just flat out do NOT know what they’re talking about. 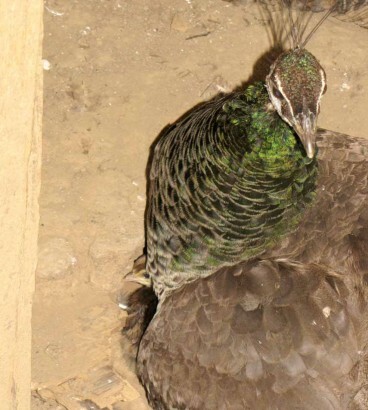 I went out to do chores a while ago, and there were the usual 2 peacocks, 4 peahens… one of which is still sitting on a nest. 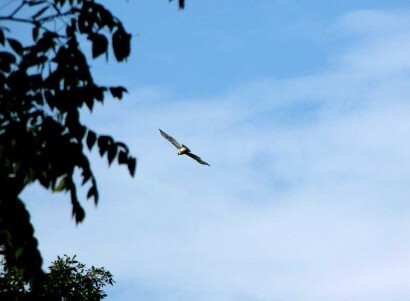 When I got closer to her, I saw an eye staring back at me where eyes shouldn’t be. Still too hard to see? Well, let’s look a little closer. . . 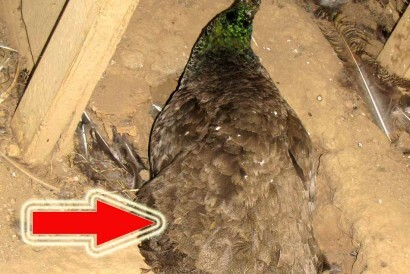 The arrow points out the peeping eyeball! 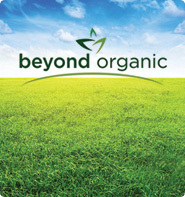 And an even closer look…. 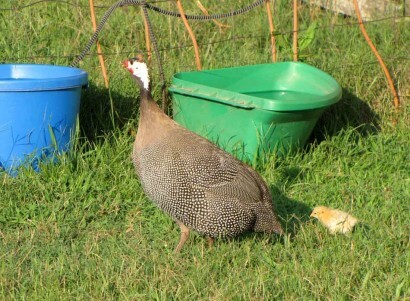 The little peachick got restless and moved forward where he (she?) could look at me in safety from right beside mama’s front. . . I can see clearly now, the feathers gone! 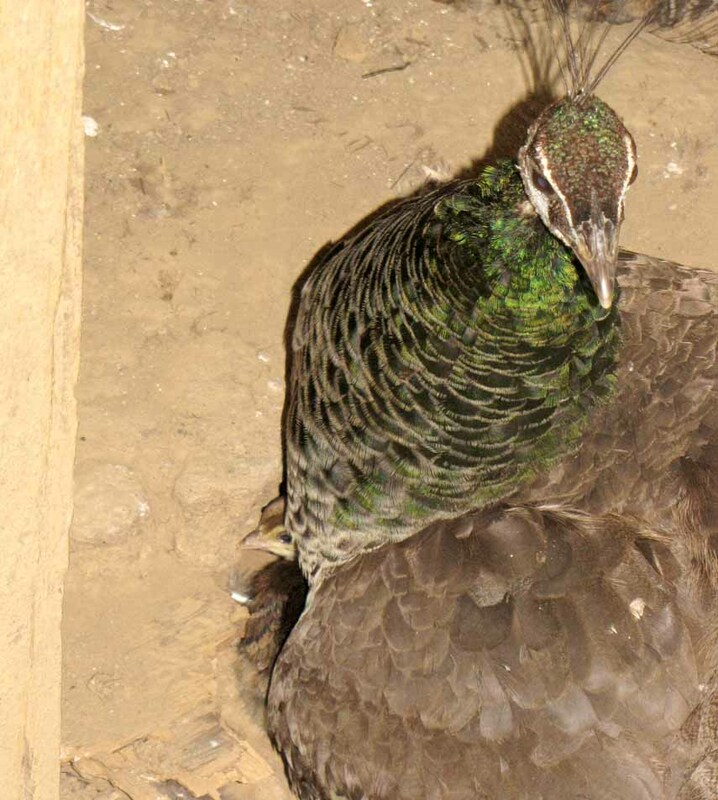 Mama peahen wasn’t thrilled with me being there and humming and agitated. Finally she got up off the nest for a minute. Oh ho! 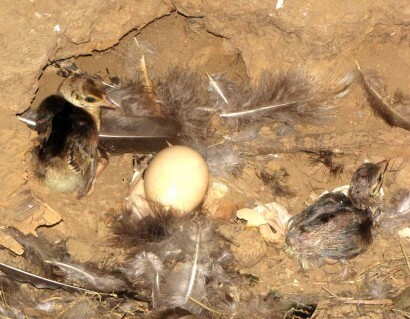 Not only was there one peachick active enough to be peeking around at me, there was another newly hatched! I threw the feed in the bowl and beat a quick retreat so she’d go back on the nest. That brings the peachick total up to 6 this year… 4 in the bird cage on the back porch, and two under the last sitting peahen. Cool! 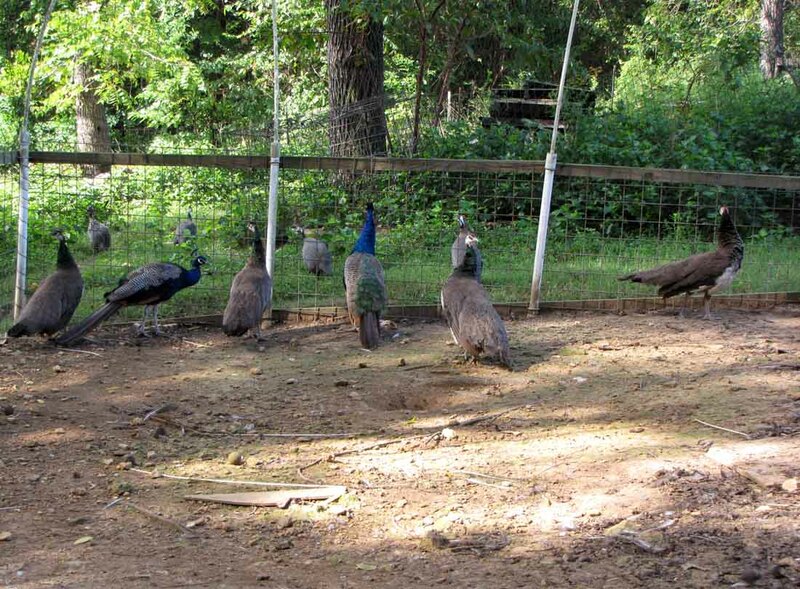 I wish I could explain to the peahens WHY I took away their chicks. The little peachicks look healthy and seem to be doing fine with their mama peahens. 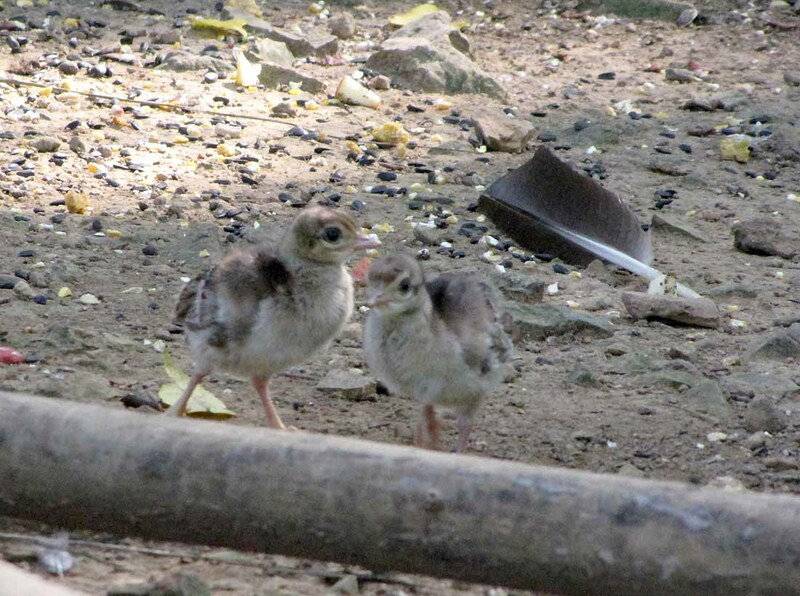 But past experience has made it pretty plain that if I don’t segregate them, sometime between 6 and 14 weeks of age, the peachicks will get listless, and eventually just keel over and die. Since the adults appear healthy, as do all the chickens and guineas, it took me a while to figure out what was going on. As the saying goes… you don’t know what you don’t know. And what I didn’t know about was a funky little protozoan parasite named Histomonas meleagridis. To cut to the chase of the complicated dissertations I found in The Merck Vet Manual and other places, this punky little protozoa lives in a nematode (unsegmented worm) called Heterakis gallinarum that lives in the intestinal tracts of chickens, turkeys, and yes, peafowl. Some of the protozoa and eggs are excreted in the droppings, then when the birds eat anything nearby, they ingest the protozoa too. Not only are these protozoa hiding inside the poultry, they are also found in three different species of earthworms… and bet you see where that is headed. 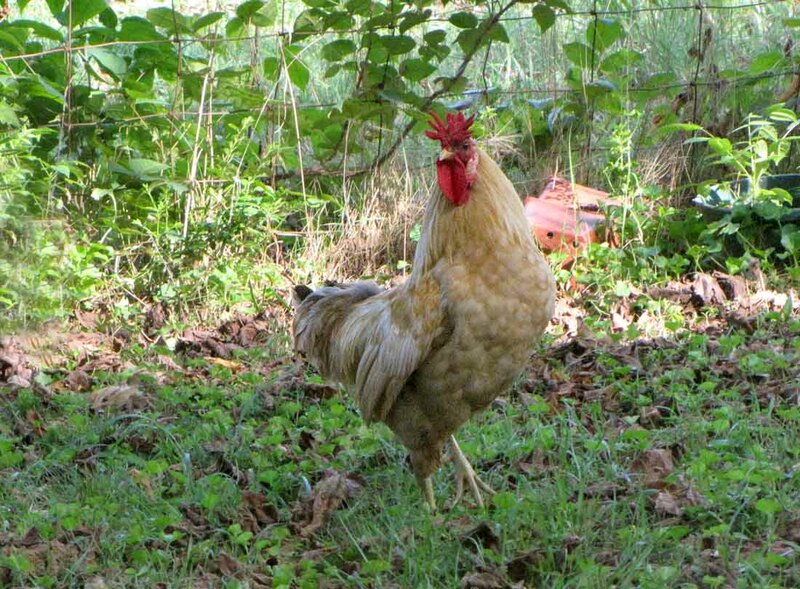 The fowl eat the earthworms, and if they didn’t have the protozoa before, well, now they do. 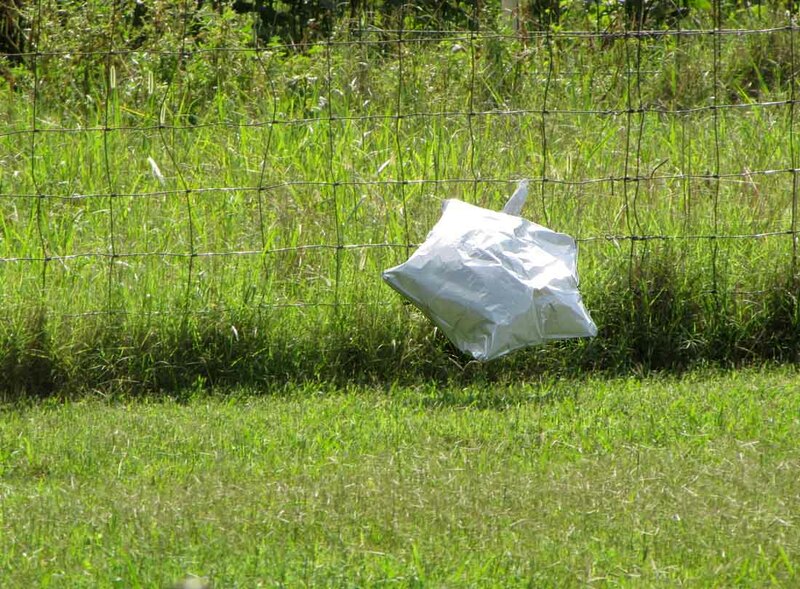 And if all that isn’t bad enough, the protozoa can be dormant in eggs in the ground for years. I haven’t found anything anywhere that gives any indication you can eradicate it. So if once you ever figure out this protozoa is on your farm, you just might as well get used to dealing with it. As it turns out, birds are most susceptible between 6 and 14 weeks of age to getting Histomoniasis, an infectious intestinal disease caused by the aforementioned protozoa. 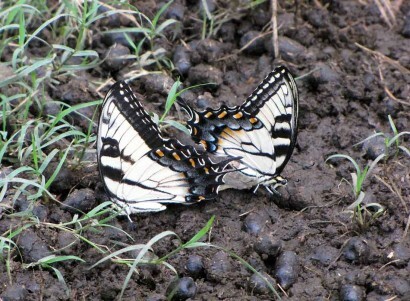 Their droppings become watery, they act sleepy all the time, and get weak. Eventually, most of them just fall over and die. 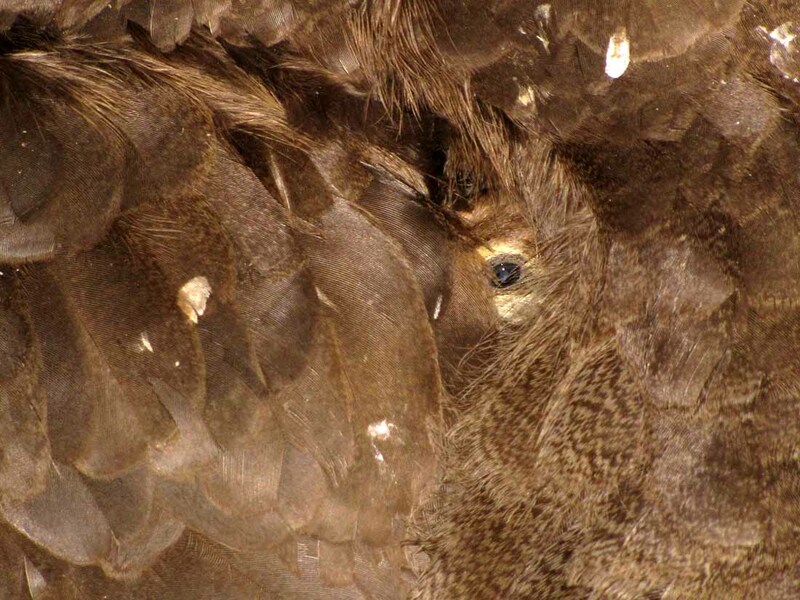 The common name for this disease is Blackhead, supposedly because sometimes the heads of affected birds turn black. Not very helpful, I’m thinking. The drugs are available in other countries, just not here. So the best you can do, near as I can figure out, is take heed of the advice to frequently worm birds to reduce exposure to the heterakid worms that carry the infection. And if you’ve got peafowl, and I suspect turkeys from what I’ve read, you’d better separate the chicks from all the other birds, until they get past the danger period of 14 weeks old. 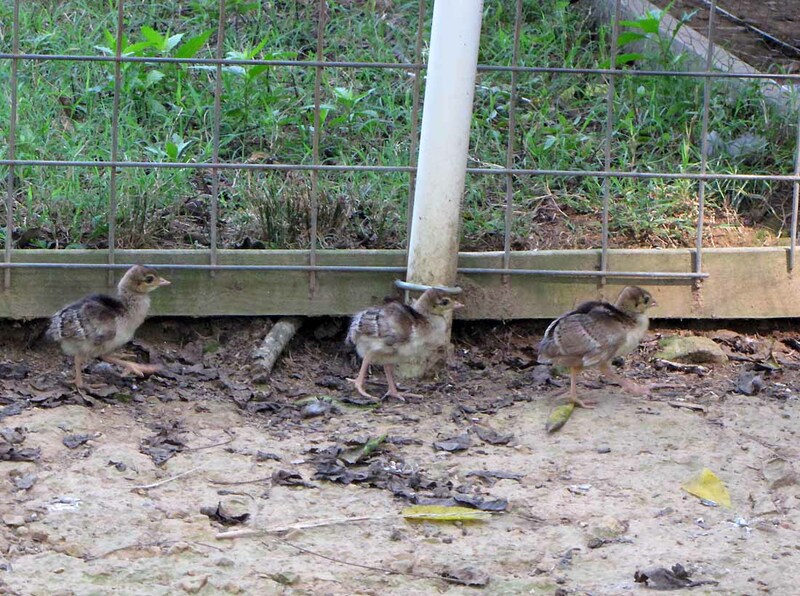 The mama peahens are mad, and the peachicks are none too happy either… which is why I wish I could explain it’s quarantine or die!